I remember the day I discovered the joy of playing with a prism and the power generated by a magnifying glass. I was sitting on the windowsill of our fifth grade classroom and chatting with friends. We were looking at Mrs. Grace’s plants and goofing around with the magnifying glasses and prisms. I was fascinated by the rainbows appearing on our notebook paper when we held a prism just so between our fingers and thumb. What an amazing thing, this ray of sunlight! I studied the spectrum, trying to figure out just where one color ended and another began. A friend was playing with the magnifying glass. She was fascinated by the pinpoint of bright light that she could generate by steadily holding the magnifying glass in one position and letting the sunlight pass through the glass. As we watched and laughed at the wonders of science, her paper began to smoke, and the little spot of bright light turned brown. The paper was on fire. There was one collective intake of breath, and then everyone was silent. We had heard about that sort of thing happening, and now we had witnessed it for ourselves. If you’ve ever played with rays of sunlight, you understand how our lives can be a prism in the hand of God. Our works become a rainbow of colors for all to see. Beautiful. Drawing the eyes of others toward God, causing their souls to marvel and wonder. 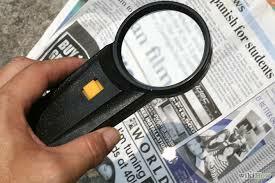 Our souls can be a magnifying glass in the hand of God. We lift our hearts up, and Jesus Christ is magnified. Everyone in proximity holds his breath in wonder, in awe. Miracles happen. Lives are set ablaze. The divine light reveals our unique gifts, like the colors in the rainbow. The divine light reveals God himself. Power. Majesty. The consuming fire of God. That day, on a windowsill in a fifth-grade classroom, a group of children were stunned into silence for just a moment. We had been fascinated by the rainbows. But when we realized the power of the sun, and what we could do with a little magnifying glass, we made no sound at all. This was a power too great – something too important – to misuse. We looked at each other with big eyes and open mouths. And we quietly put the magnifying glasses away in a box. We had uncovered a secret about the sun that demanded maturity, awe, respect. When we opened our science books, we now understood as children who had experienced it personally. Hands-on education. The kind of learning that sticks around long after the test and the last day of class. The kind of learning that even the most apathetic student will abide. Yes, he will keep coming back to discover more. And so it is in matters of faith. Let the little ones – the curious and the apathetic ones – gather around. Let them see the Son as he passes through your life, yielding the colors of love, joy, peace, patience, kindness, self-control. Watch, as he displays his power in the middle of human suffering. Or sorrow. Or death. Miracles happen right here. And everyone is stunned. They cannot help but ponder it all. And they will not forget. It’s Mrs. Grace’s classroom all over again. St. Catherine of Siena once said we will set the world ablaze if we become what we were meant to become. And what is that? A magnifying glass in the hand of God. Come, let us magnify the Lord, together.